The textbook view of the medieval Cistercians is that they were a monastic order with a particular fondness for the margins. Browsing through introductory surveys one will read that Cistercian abbeys were hidden away in valleys and isolated places, and one will probably also read Walter Map's provocative comments that the Cistercians actually created these isolated places in the first instance, via a concerted practice of depopulation. Prompted by a variety of surviving sources and scholarly priorities, research on Cistercian isolation has taken many forms. Theological studies have produced insights into the emotional, conceptual and spiritual meanings of withdrawal while, on the other hand, economic and geographic investigations have suggested that the Cistercians were fully integrated into local economies and social networks and were in fact never as isolated as they claimed to be. 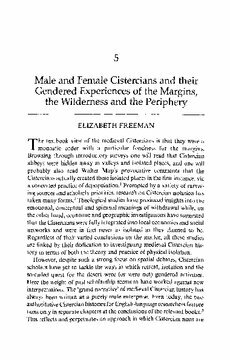 Regardless of their varied conclusions on the matter, all these studies are linked by their dedication to investigating medieval Cistercian history in terms of both the theory and practice of physical isolation.